Too many businesses put an overwhelming focus on lead generation and not enough on lead management, which is the next vital step in turning leads into customers. But the flip side of these trends is positive: by optimising your lead management process, you can usually generate a meaningful bump in marketing Return On Investment. Some of our clients have been able to achieve 25%+ growth in new inbound revenue by getting serious about the techniques and strategies we’re about to cover. 1. What Is Lead Management? A Lead Management Definition: Lead management is a set of methodologies, systems, and practices designed to bridge the gap between the lead generation and sales functions. 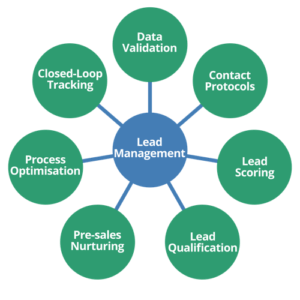 Lead management methods include contact protocols, lead scoring, lead qualification, pre-sales nurturing, process optimisation, closed-loop tracking and other techniques to optimise the value of leads flowing through your sales process. This part is for you if you just want to know the practical, data-driven processes you should be executing to maximise the value of your leads. Many of these are methods are cheap or free, and can be executed without the use of any wildly exotic software or special lead management apps or plugins. Use form validation, microcopy and tool tips to ensure contact data is as accurate as possible. Typos in email addresses and/or phone numbers can make otherwise good leads uncontactable. Specify mobile input types to optimise mobile user data entry. This is critical now that 50%+ of all traffic comes from mobile. Call leads within FIVE MINUTES of receiving an email lead. Research shows that doing this increases your chance of a first-call contact by 400%, compared with a 10 minute callback. Send lead notifications to a Slack channel when you receive an inbound lead. Why use this instead of email? Slack cuts through email inbox noise and your team can be notified instantly. 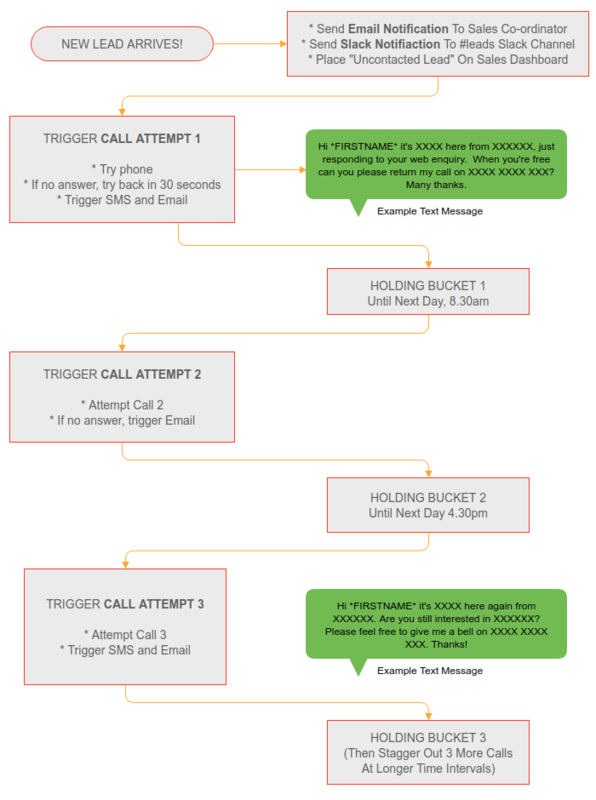 Send an automated SMS to the prospect, using a marketing automation platform and an SMS provider. This can be sent automatically on contact, or later in the process (e.g. after the first unsuccessful attempt to connect via phone). Inside the SMS, send a link to a welcome video, creating excitement around your prospect’s desired end state and more details about what happens next (e.g. they’ll receive a phone call). Send an automated email instantly. Also show your welcome video, or another useful bonus, on your Thank You Page. The purpose of this is to create sales momentum and make the prospect look forward to your contact. Follow up with leads with at least 12 touches before you give up. Up to 12 touches, the data say your chances of creating a contact will improve. Beyond 12 touches, you hit diminishing returns. The best times to contact prospects are: 1) Within 5 minutes of the contact. 2) 7.30am – 8.30am in the morning. 3) 3.30pm – 5.30pm in the afternoon. Change up the time of day you attempt to contact the prospect. The best days of the week to reach prospects are Wednesday and Thursday. Friday afternoon or Monday morning are generally not good times, unless you’re following the 5-minute rule. Use a simple lead qualification script and/or lead scoring protocol to ensure only “sales ready” leads are passed on to your sales process. (For Extra Credit) Send a “Shock and Awe” pack in the post. This is a hefty physical mailing containing elements such as your company brochure, a case studies guide, templates, stickers, fridge magnets, and other items that provide value. The goal here is to (a) differentiate yourself and (b) provide as much instant gratification/value as possible. Tips are great, but it’s sometimes hard to visualise how to tie them all together. Large-scale Lead Response Management studies. The results of one such study are presented in the Infographic below (Credit: Inside Sales Blog). 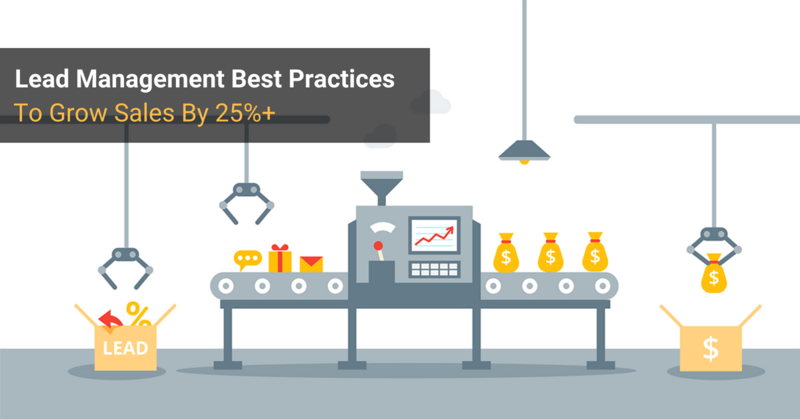 This infographic contains a wealth of advice that will help you to manage leads more effectively. What are the areas where you could improve? 77% of all leads submitted in the study never received a phone call. Most sales reps call leads 3 times. If they called them 6 times instead, they’d talk to 70% more contacts! The optimal response time is 5 minutes – but the average response time was 44 hours! The average number of touches when following up with sales leads was 4.47, but the recommended number of touches is 12. TRANSLATION: Most of your competitors are doing a shocking job at this. If you make this an area of excellence, you will WIN. Far too often, lead management is an afterthought. Or, when leads aren’t easily contactable, or don’t immediately return calls, the prospects are blamed (“tyre-kickers!”), and not the process. 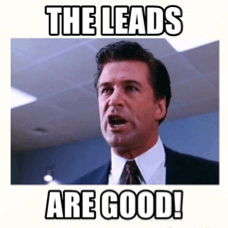 Not every lead will be contactable, and not every prospect will buy, but it’s your job to get the best results out of a given batch of leads. Just like a mining company who is looking to get the most gold out of every tonne of ore, you’re looking to focus on extracting all the gold lying hidden in your lead flow. And the more you’re investing in marketing and sales generation, the more important lead management becomes. So: treat lead management just like you would any other part of the marketing equation. Drill down a process, create some workflows and build lead management into the performance reviews of your team members. And if you don’t have the time, expertise or interest to do this yourself, get in touch and we can discuss building the processes you need for you.